Not entirely true. Who would have guessed that Franklin would have some of the most splendid antiquing spots that made me positively swoon?! Let’s start with City Farmhouse. The interior is sparsely furnished with goods- but the goods are gorgeous and deserve the space. It was right up my alley- long farmhouse tables covered in aqua mason jars and old bottles…pieces of white picket fence surrounded by salvaged door hardware…Hoosier cabinets filled with vintage kitchenware. You get the picture- which is good because I was in such a happy trance that I forgot to snap one. So I went out back, and found wonderland. I wound my way around gorgeous old doors and street signs…salvaged wood and columns…headboards and planters…all the while being led around by the shop owners darling kitten, who was a most curious hostess. A shop kitty and her wares. While I didn’t make any purchases, I rambled over next door to the Winchester Antique Mall. I was already high on Cloud 9 from City Farmhouse…and then Winchester elevated me to Cloud 10! I was immediately smitten with these old English artist palettes- wouldn’t they be stunning as wall art? And don’t you just want to pin up a hammock and sleep among these treasures? I had an overwhelming urge to move in- of course, only if they allow husbands and cats. I did find some treasures to take home with me- a pretty piece of embroidery (with a misplaced apostrophe), a fun jar filled with weathered clothespins, and an old wooden “R” (last name initial) that will be used for…something. And just like that, I decided to love Franklin, Tennessee. Thanks! 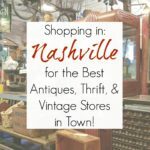 I love exploring new towns and checking out their antique, vintage, second-hand, and junk stores! Project bits AND project inspiration.